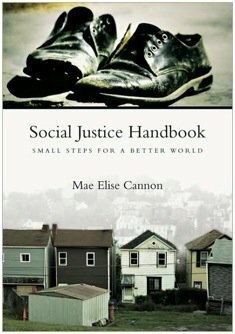 A few weeks ago while at the NYWC in Atlanta I picked up the Social Justice Handbook by Mae Elise Cannon. This is and continues to be the most epic book I have read in a while on Justice Issues. The book is separated in two parts. The first part, which is recommended that you read from beginning to end has to do with what Jesus and the Bible says about justice. It goes through verses, ideas and commands from Jesus on why we should do justice and how it is strongly on the heart of our Lord. The second part of the book goes through different justice/injustice issues such as AIDS, Human Trafficking, Poverty, etc . The book, with a tag line of ‘small steps for a better world’ is a broad overview and introduction to Justice. Mae gives practical applications on how to engage in these areas of justice. The thing I love about this book is that it takes these massive overwhelming justice issues and breaks it down to show us that simple steps of justice and bring change and make a difference. If you have some extra dollars and are interested in building your library and knowledge of Justice please pick up a copy of this book. You can also read another review over on my friend Jamie’s site here.